On Friday evening we travelled to the occupation being carried out by Defend Education Birmingham, to show our support to the brave students standing up against wave after wave of attack by the university management, the police and the government. Left Unity must stand shoulder to shoulder with students involved in direct action, we must organise with them to defend occupations and protest action against the continuing attacks on our education system, not only in Birmingham but across the whole country. Birmingham University like all higher educational institutions have been hit with rising fees, creating a system where thousands upon thousands of young people are starting their lives in debt. Increasingly education is being made into a privilege, when it should be a right. The students at Birmingham are also occupying in support of the staff at the university, where conditions are increasingly getting worse. This has to stop! 2. That the University of Birmingham make a public statement against the privatisation of student loans and in defence of the public university. 3. The Vice Chancellor should sign up to the Council in Defence of British Universities or the Campaign for the Public University. 4. That the University’s total income per student place from halls should be frozen next year, and that the cheapest fifth of halls should have their prices decreased. 5. 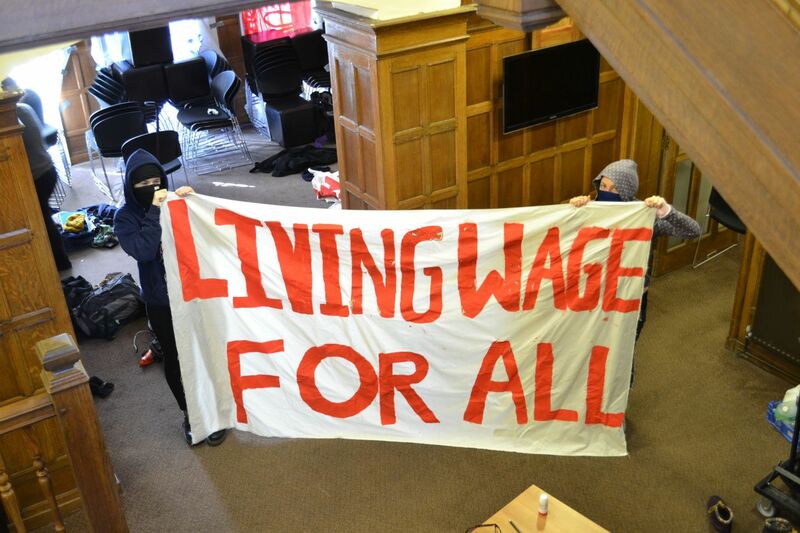 That all staff working for the University of Birmingham- including those employed in house, by external contractors, and the Guild of Students- should be paid a living wage. 6. That the pay ratio between the lowest paid and the highest paid staff in the university should be reduced to 10:1. 7. That a body should be set up made up of elected students, academic staff, and support staff. This should have ultimate oversight over the restructuring of departments, the University’s investment decisions, and its lobbying positions. 8. That the University produces a publicly available Ethical Investment and Procurement Policy which is reported on annually with plenty of opportunity of engagement with staff, students and other key stakeholders. 10. That the Nursing course faces no loss of investment and no redundancies. We immediately call for the university of Birmingham to repeal all suspensions and provide a caste iron decree that no students involved in recent protests will face any repercussions for their brave actions. Left Unity’s Bianca Todd had been given the honour of being invited to address those at the occupation, she was accompanied by Stephen Miller of LU Northampton and Sharon Mccourt of LU Birmingham, other LU members were also involved in the occupation it self. She started her speech by giving words of solidarity from Nottingham and Northampton Branches before entering into a talk about the importance of unity and solidarity with the 98% Reflecting on historical student occupations of the past such as France in 1968, examining why that was successful and how Left Unity can support students to build the party electorally and through grassroots activism. On socialism she talked of a socialism of the heart, of socialism being like a family and that we should work together in unity against our attackers. Afterwards a discussion was held by all involved where the idea of an alternative student union was debated, placing the emphasise away from supporting university management to supporting university students, additionally challenging the corporate image of students lifestyle. The importance of the role of liberation struggles within Left Unity and the part we choose to play in them was highlighted as very important to some of the students at the occupation. We also touched upon Left Unity’s strategy being greater than a narrow electoral focus, while talking of a new pragmatic left and how political parties can be brought into the 21st century. We all left feeling inspired for the future, and hopeful of what we can achieve through working together. Thank you for having us Defend Education Birmingham, you are doing the movement proud with your defiance of the heartless, soulless attacks on education, the working class and real people. Let this be one of many in a long line of actions which brings power back to the powerless! We do not know what the future holds for the movement but Left Unity cannot and will not stand idly by, it must get involved in the struggles of the students and of the people. Energy Crisis? What Energy Crisis! ?